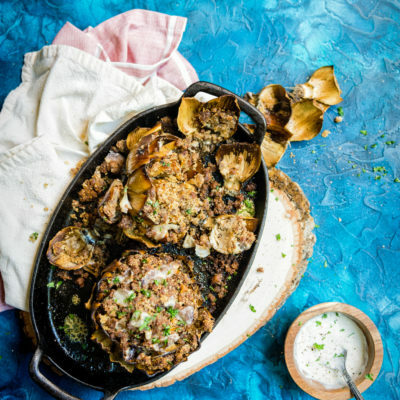 This Smoked Sausage Stuffed Artichoke recipe is an elegant spin on a classic with a combination of delectable Italian flavors for a perfect seasonal appetizer. Artichokes are one of those foods that are incredibly hard to justify preparing. They are tough, have a short season in the market, and require prep-work before you get to scrape out the few edible bits between your teeth. If you actually manage to not choke on anything. And yet, artichokes are crazy delicious. And one of those foods I always savor when I bother to give myself to the time to prep and make. Since the days of the Romans, artichokes have been a staple in a Mediterranean diet. They can be found growing around the region as well as in the Americas and Africa. 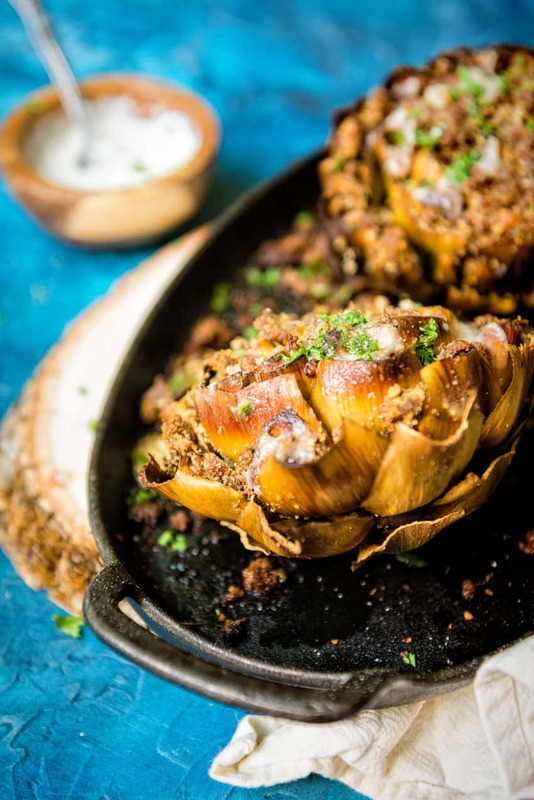 From grilling to baking or steaming and now, smoking, the artichoke is a fun interactive food that inspires engaging conversation while enjoying a meal with company. To pick a good artichoke, feel the weight. You are looking for the heavier ones. They should have tightly bound leaves that are enclosed on themselves. Artichokes travel well and can last a week or two stored. The leaves will lose their color as they dry out over time. Once chosen, use a sharp knife to chop the top of the artichoke off, trim the stem, and use kitchen shears to trim the pointed tips off of all the remaining outer leaves. At this point, I tend to use my hands to open the artichoke up, spreading the leaves apart from each other and rinse quickly with cold water. Shake out any excess and immediately rub fresh lemon juice over any recently trimmed areas to prevent browning. From there, you will prep your artichoke as required for your recipe. 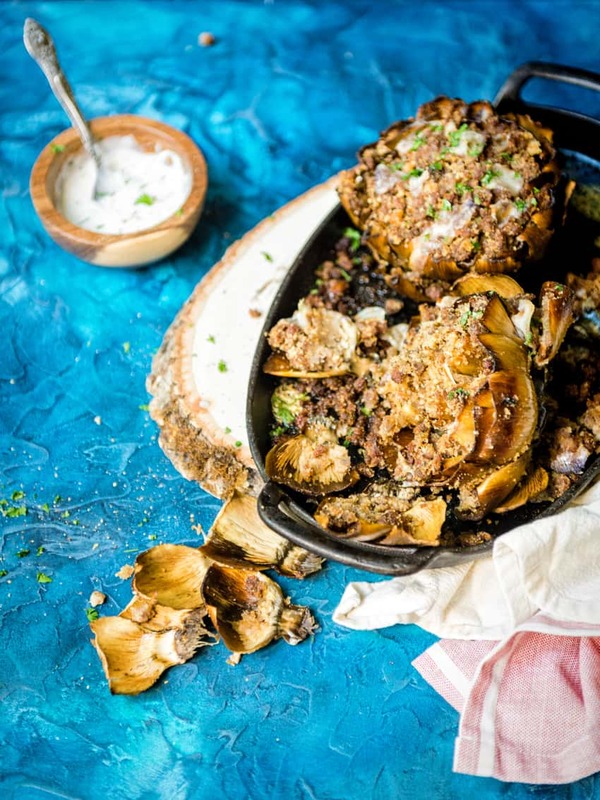 For this smoked sausage stuffed artichoke recipe, I decided that I could stuff the artichoke with an amazing garlic sausage and smoke to infuse serious flavor. I used my Traeger Grill with hickory chips to send a subtle smoke flavor through this artichoke as it softened during the cook time to fork tender. Basting the artichoke with clarified butter helped to keep it moist before topping with fresh goat cheese immediately when pulled from the grill. Overall, it was one of my favorite ‘grilled’ artichokes but certainly was more work than my standard go-to grilled artichoke. 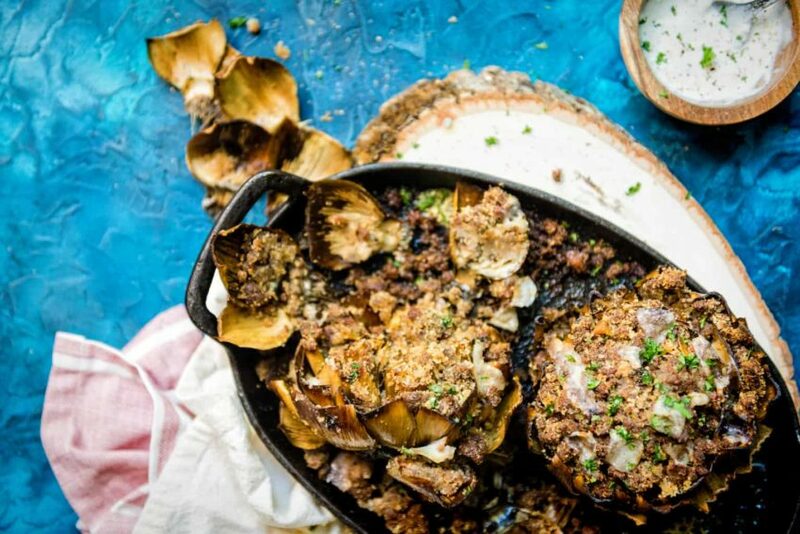 If you’ve tried my Smoked Sausage Stuffed Artichoke recipe, or any other recipe on GirlCarnivore.com please don’t forget to rate the recipe and let me know where you found it in the comments below. I get inspired by your feedback and comments! You can also FOLLOW ME on Instagram @girlcarnivore as well as on Twitter and Facebook. 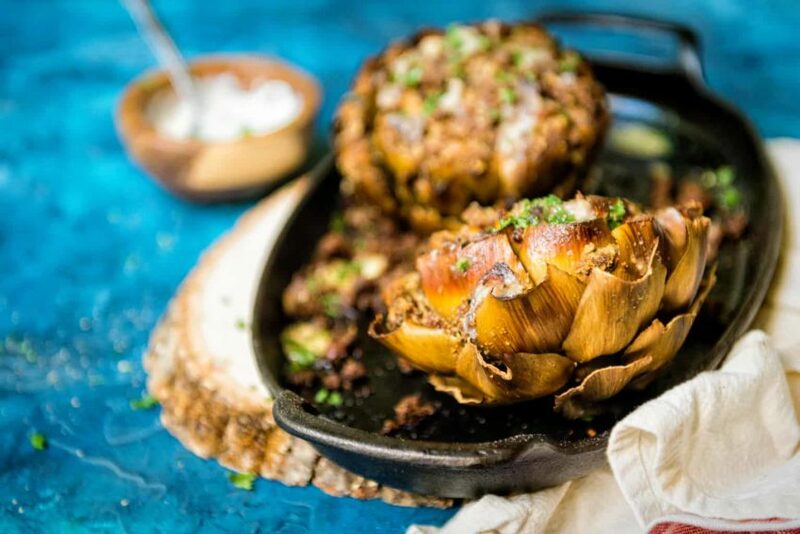 This Smoked Sausage Stuffed Artichoke recipe is flavorful and easy to make. Starting with the artichokes, remove the top with a sharp knife. Trim the pointed ends of each leaf with a pair of kitchen shears. Trim the stem and using a peeler, remove the tough outer skin from the stem. With your hands, work the artichoke leaves away from the center, exposing the inner tight leaves. Using a pointed spoon, or carefully with a sharp paring knife, remove the inner choke. Rinse the artichoke with cold water and immediately rub lemon juice over the freshly cut exposed areas. Meanwhile, brown the sausage in a skillet, crumbling as needed, until cooked through. Set aside to cool. Preheat your smoker or grill for 375 degrees. Clean the grate and allow the smoker to come to temp. Combine the cooked sausage and breadcrumbs in a bowl and season with salt and pepper. Working carefully, but with force, push open the leaves and stuff the artichoke, working from the center out. Place the artichokes in the smoker and spoon a tablespoon of butter over each. Cover and cook for about an hour, until the bottoms are fork tender, spooning more butter over the artichokes every 20 minutes. Remove and spoon remaining clarified butter over top and sprinkle immediately with the goat cheese crumbles to melt. Whisk the mayo, sour cream, and juice from 1 lemon into a small bowl. Add 1 teaspoon of zest to the mix and season with salt and pepper. Sprinkle paprika on top. When ready to serve, garnish with freshly minced parsley and serve with the whisked mayo mix.